They Debuted in 1987. 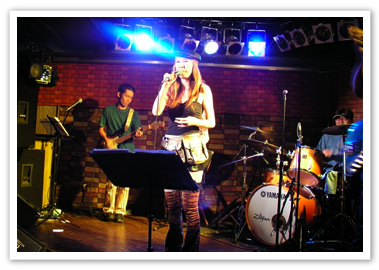 They performed by the oldies nightclub of Shinjuku as the main vocal of the regular band for one and a half years. Afterwards, They performed as a guest vocal in the live house in Tokyo various places around the oldies. They came to sing the tune of R&B and the Soul since '98, and actied the tune of Soul and disco as a vocalist of the band that performs around the hit number at '70-'80 age in a lot of live houses since the '91 year . Moreover they are acting widely by trio that play the standard pops in the lounge at the hotel and singing the jazz a backed piano in the culb.